Lake House South condo is situated on 5 acres of beautifully landscaped grounds located at the water's edge of Lake Boca Raton. This boutique 17-story building is home to just 123 luxurious condominium units which boast incredible views of the Atlantic Ocean, Lake Boca, and the Intracoastal Waterway. Many condos and amenities have been renovated since its 1970 construction. These 2-3 bedroom luxury condos range from about 1,450 square feet to 3,000 square feet of living space. Every unit has a view of either the ocean, Intracoastal or Lake Boca with several units having a combination of two or more. Most units have been renovated to include hurricane impact glass and washers and dryers inside. Included below are condos for sale in Lake House South, a development in Boca Raton, FL. These real estate listings are updated daily from the MLS with large photos, maps, local school info, and detailed property info. Lake House South offers a wide variety of amenities to residents including 24-hour security, bike storage, business center, new exercise facility and a BBQ pavilion with grills, sinks, large picnic tables, and benches. There are also jogging and bike paths, a library, lobby, picnic area, on-site management and staff, an Olympic size heated pool and sun-deck directly on Lake Boca, two saunas with showers and bathrooms, and an underground garage parking. Boat dockage is available as there are 20 boat slips individually owned. Lake House South is located on Camino Real one block west of A1A and surrounded by key Boca Raton water landmarks. 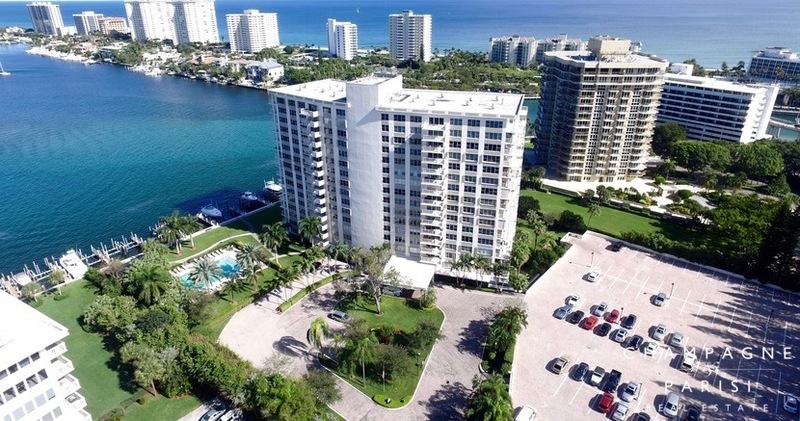 The condos sit directly on Lake Boca, are a walk to the Atlantic Ocean, Intracoastal Waterway, Boca Inlet Beach, South Inlet Park Beach, Royal Palm, and Boca Raton Bridge Hotel and world-renowned Boca Beach Club. Additional luxury condo buildings surround Lake House South such as Boca Inlet and the Carlton. Downtown Boca Raton and Mizner Park are only minutes away. If you are interested in learning more about Lake House South or any of the other waterfront condo developments in Boca Raton, please call us at 561-235-7800. You may also contact us by providing your information in the brief form provided below, and one of our Boca Raton luxury condo specialists will reach out to assist you. We at Champagne & Parisi Real Estate look forward to helping you with your unique Boca Raton Real Estate needs.